The demand in the global HER2 antibodies market is projected to increment at a robust CAGR of 8.6% during the forecast period of 2017 to 2025, primarily gaining from growing awareness regarding the prevalence of HER2 positive breast cancer. As per the figures provided by The American Cancer Society, 252,710 women were to be diagnosed with breast cancer in the U.S in 2017, with one in five females suffering from HER2 positive breast cancer. The global HER2 antibodies market is estimated to be worth US$ 21,669.1 mn by the end of the forecast period, i.e. 2025, considerably up from its evaluated worth of US$ 10,087.8 mn in 2016. Geographically, the HER2 antibodies market has been bifurcated into the regions of North America, Europe, Asia Pacific, Latin America, and Middle East & Africa. In 2016, North America accounted for the most prominent share of 42.7% of the global HER2 antibodies market, followed by Europe with less than a quarter of the global demand. This strong demand from the two regions is attributed to well-established health care infrastructure coupled with awareness of population regarding the treatment of HER2 breast cancer. The market in North America and Europe is expected to dwindle during the forecast period due to maximum top selling brands in these regions will be encountering by their exclusivity and patent expiry. Revenue-wise, U.S. is the most profitable country-wide market for HER2 antibodies in North America while Rest of Europe and Germany market leading the Europe region. Asia Pacific may provide an attractive market for the HER2 antibodies because of increasing per capita income and increasing healthcare facilities and awareness regarding HER2 breast cancer. Besides Asia Pacific, Latin America region too is focusing on increasing the diagnostic rate of cancer and types of cancer, which will be driving the market during forecast period. Governments and non-profit organizations in the region are striving to spread awareness and control the increasing incidence rate of breast cancer. The incidence of cancer in Middle East & Africa is currently lower than that in countries such as the U.S. and the U.K. However, it is expected to rise rapidly compared to other regions in the next decade. 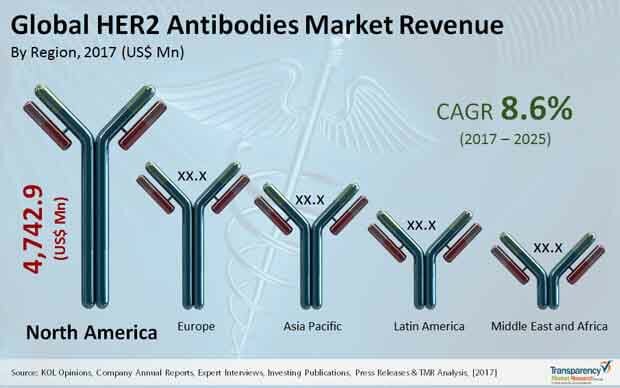 Novartis AG, Genentech Inc., Abnova Corporation, Pfizer, Inc., InvivoGen, Biocon Limited, Bio-Techne, and Celltrion, Inc. are some of the key companies currently operating in the global HER2 antibodies market.